The demise of Marco Rubio has left the Republican Establishment faced with an unpalatable choice between Donald Trump and Ted Cruz. And so, as they tend to do in times of stress, Republican insiders now turn their eyes to Paul Ryan. 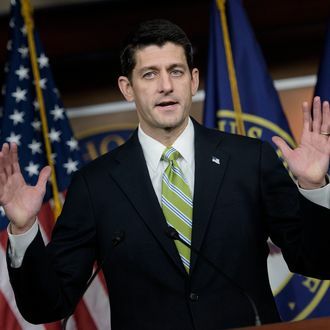 Ryan has been called the Republican party’s “pope,” and a Republican staffer today goes further, telling Politico, “He probably wouldn’t [do it] but everyone thinks he’s Republican Jesus.” John Boehner has openly endorsed the idea of a Cleveland miracle that would transform piles of delegates for Trump and Cruz, through a deadlock, into an eventual Ryan nomination engineered by party insiders. In an interview with John Harwood, Ryan did not exactly drive a stake through the idea. “You know, I haven’t given any thought to this stuff,” Ryan replied, when asked about him getting the nomination. “People say, ‘What about the contested convention?’ I say, well, there are a lot of people running for president. We’ll see. Who knows.” He works in strange and mysterious ways.